The JR Kosei Line runs between Kyoto Station and Omi Shiotsu Station in Shiga Prefecture. It connects destinations in western Shiga with Kyoto. The Kosei Line runs along the west side of Lake Biwa and the name “Kosei” actually means “west of the lake”. Trains depart from platforms 2 and 3 in Kyoto Station. There are 22 stations on the JR Kosei Line. The following are the stations you are most likely to visit. Transfer here to the JR Biwako Line, the Keihan Keishin Line and the Tozai Subway Line. Exit here for Omi Jingu Shrine which is famous for its water clock. Omi Jingu Clock Museum is also on the shrine grounds. Transfer to here to Ojiyama Station on the Keihan Ishiyama Sakamoto Line. A short walk from this station is Sakamoto Station on the Keihan Ishiyama Sakamoto Line. Just beyond that is the Sakamoto Cable Car to Enryakuji Temple on Mt. Hiei. Hiyoshi Taisha Shrine and Saikyoji Temple can also be reached from here. Exit here for the lakeside hot spring resort town of Ogoto. Exit here for Magetsuji Temple and its famous Ukimido or “floating hall,” a famous view point over Lake Biwa. Exit here for the white sands of Omi Maiko beach, a popular destination in the summer months for many Kyoto residents. Take a bus or taxi here to visit Shirahige Jinja Shrine. This shrine is famous for the huge red tori gate which stands partially submerged in the lake waters in front of the shrine buildings. The Limited Express “Thunderbird,” which connects Kyoto with Fukui, Kanazawa and Toyama stops at this station. This is the last station on the Kosei Line, though some trains do continue on as far as Tsuruga Station. Transfer here to the JR Hokuriku Main Line for journeys south to Nagahama and Maibara or north to Tsuruga and Fukui. Otsu is the capital city of Shiga Prefecture and has a number of sites of interest, but the main sites are best reached via the Keihan Ishiyama Sakamoto Line. There are three possible routes to reach this line. From Kyoto Station take the Kosei Line to Otsukyo Station and then transfer to the Keihan Ojiyama Station. 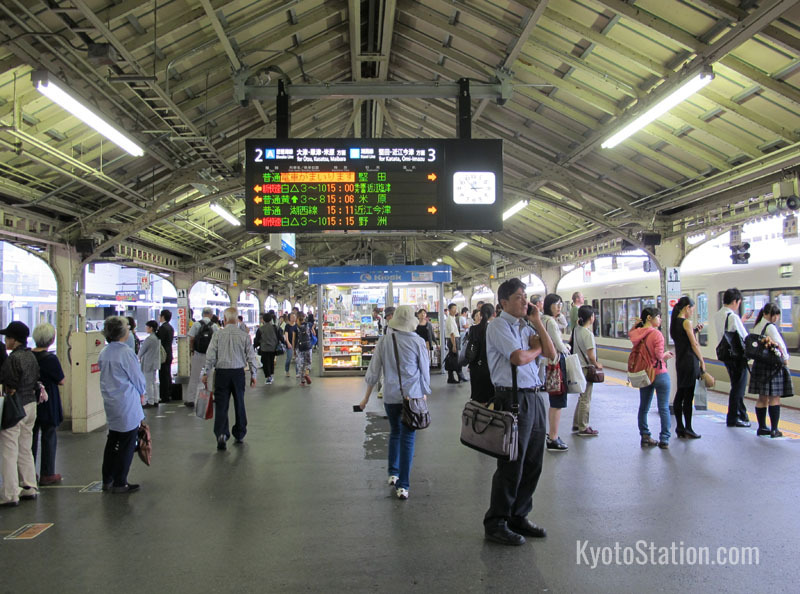 You can reach Otsukyo Station from Kyoto Station in 10 minutes for 240 yen. From Sanjo Keihan Station take the Tozai Subway Line to Misasagi Station and there transfer to the Keihan Keishin Line. Take the Keihan Keishin Line to Hamaotsu Station and then transfer to the Keihan Ishiyama Sakamoto Line. 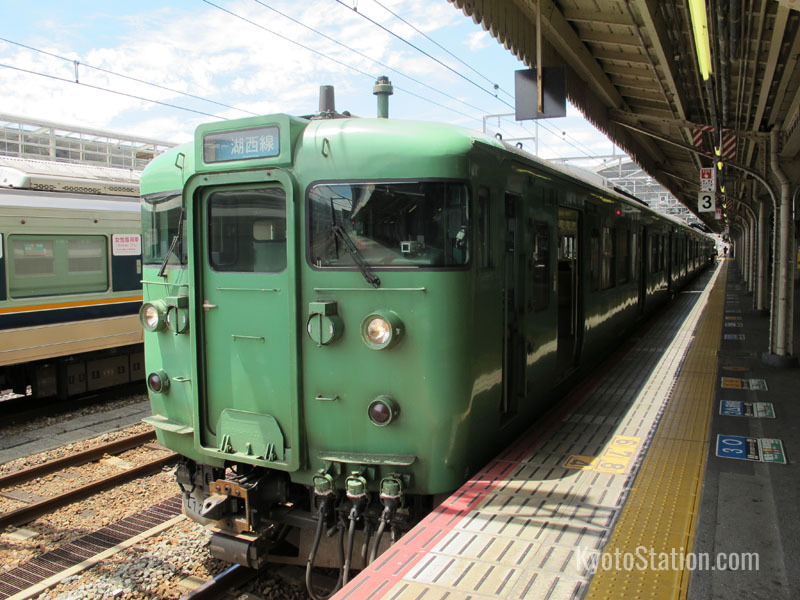 You can reach Hamaotsu Station from Sanjo Keihan Station in 23 minutes for 430 yen. This may actually be a better route to take, if you are in the center of Kyoto city and don’t wish to travel to Kyoto Station first. The main sites and stops along the Keihan Ishiyama Sakamoto Line are Miidera Temple, Hiyoshi Taisha Shrine, Enryakuji Temple and Mount Hiei – all via Sakamoto Station, and Ishiyamadera Temple via Ishiyamadera Station. To work out the cheapest and most timely route, use English language online route finders like Jorudan and Hyperdia. The JR Kosei Line is served by Local, Rapid and Special Rapid services. You can download a bilingual PDF of the guide to stops for this line together with the Biwako Line and the Kusatsu Line. The Kosei Line is colored light blue.